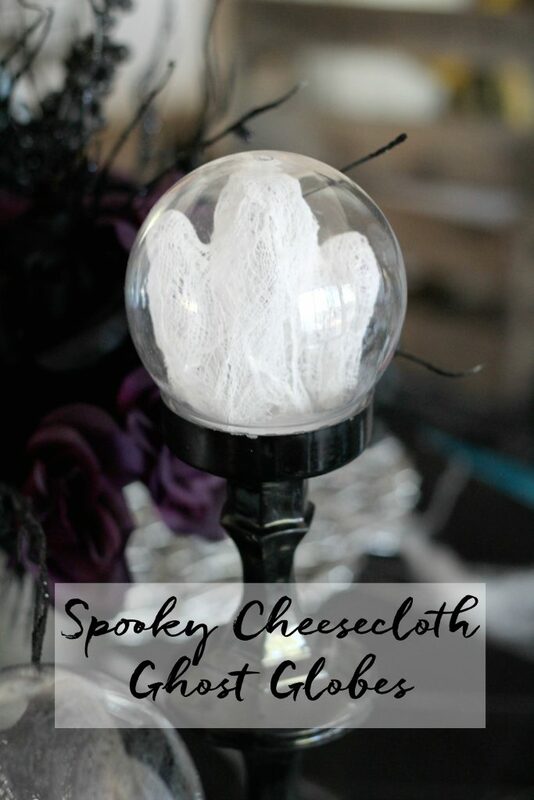 These mini cheesecloth ghost globes are a fun DIY and have a spooky impact on your Halloween decor! The girls and I needed a fun Halloween craft this week to do during fall break. The girls wanted to make cheesecloth ghosts. Easy peasy. 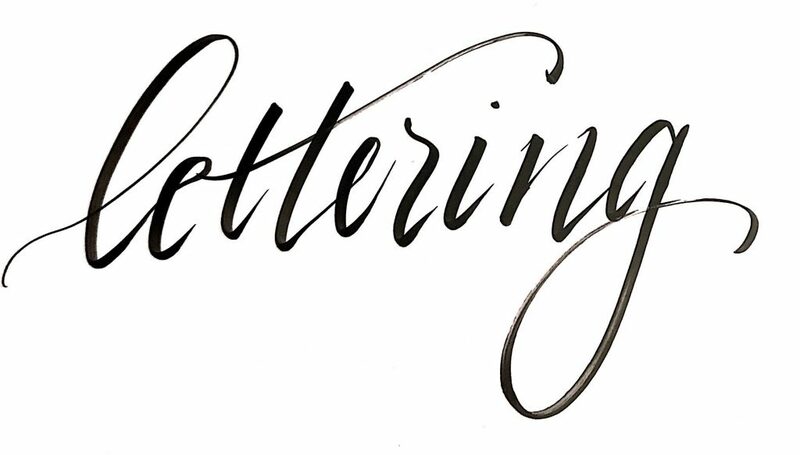 It’s a craft that has been around for centuries and can be done in a short amount of time. Ok maybe not centuries, but I remember seeing them and thinking they were cool when I was a little girl decades ago. We made three ghosts, well actually two ghosts and a dementor. For the dementor we just added some black paint to the glue. It was hard to get a picture of the dementor. Apparently they aren’t fond of photography. Oh well. 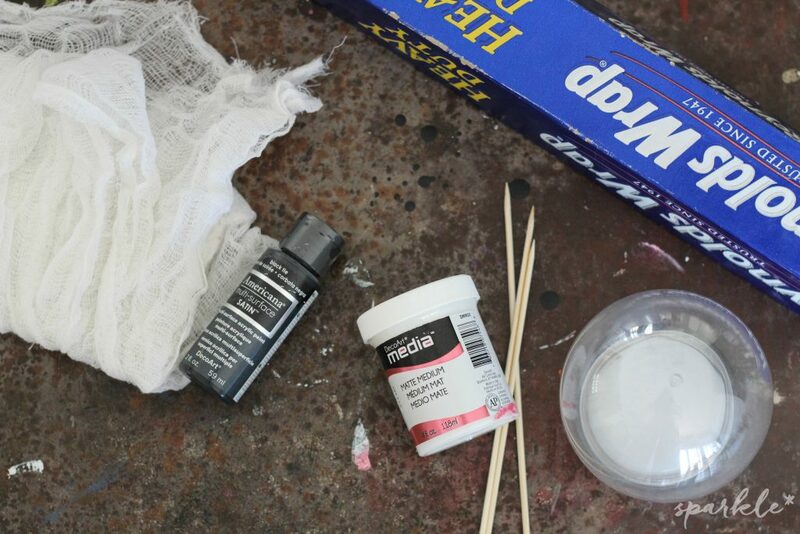 Any craft glue will work, I used Matte Medium because my Decopage glue had seen better days. The matte medium worked just fine. First, create your mold. 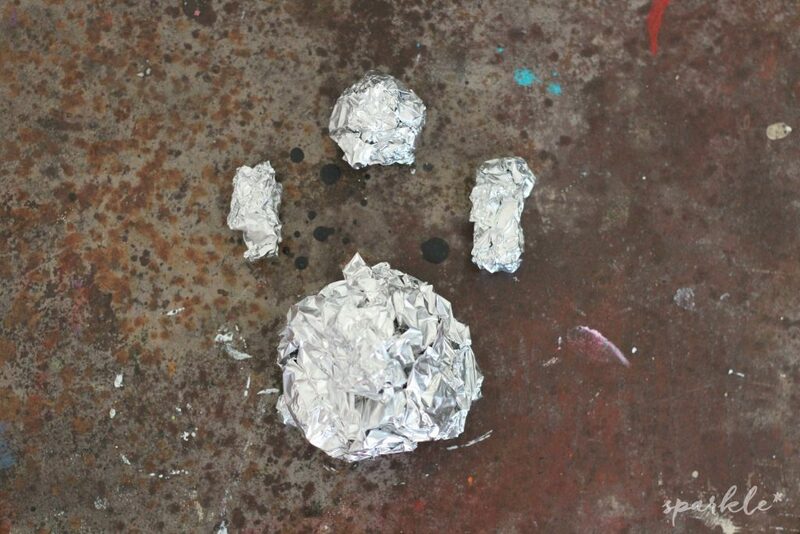 I used a ball of aluminum foil as a base and made two little oval shaped balls for the arms and a slightly larger one for the head. Stick the skewers in the balls and position the skewers in the the aluminum foil base so that it stands the way you want it. 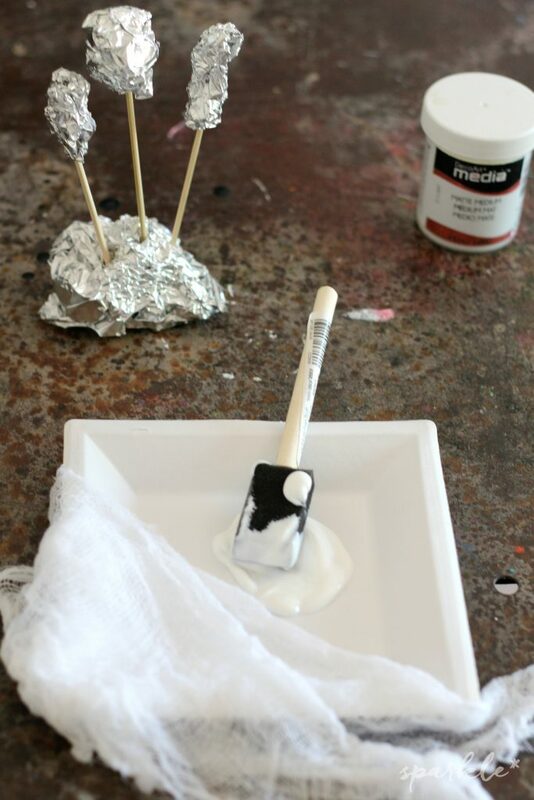 Add a teaspoon of water to the craft glue on a plate and take three 6×6 inch pieces of cheesecloth and dip it in the glue mixture. Now would be the time to add any paint if you want your ghost colored. 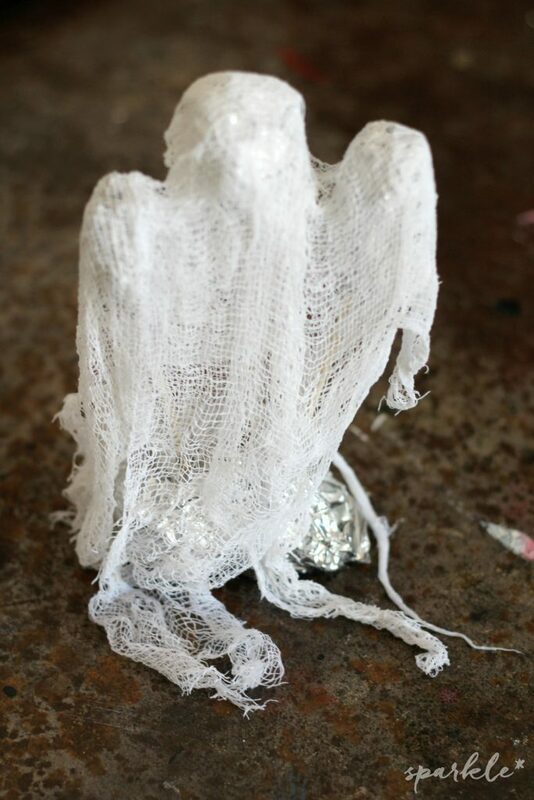 Carefully place the wet cheesecloth over the foil mold, positioning the ghost how you want him. Don’t worry about it being too long, that can be trimmed up later. While the ghosts dry for a couple of hours, spray paint the screw on base of the craft globe if it isn’t black already. Let dry. Once your ghosts are dry, carefully remove them from the mold. Trim up any ends that are too long to fit into the craft globe. Position them in the globe and display your new spooky pets. Mine are placed on dollar store candle holders which I glued together and painted black. Super easy and fun for the kids! These are great! What a fun Halloween decor piece. Pinning. 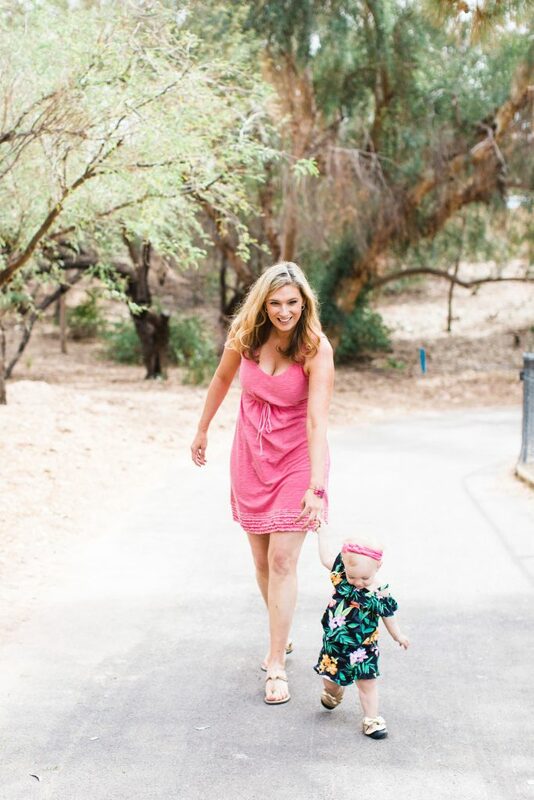 Thanks for sharing at Snickerdoodle! Fun DIY. Thanks for joining us at the Inspiration Spotlight party. Shared. These are spectacular! I can’t get over how easy they are to make. Thanks so much for sharing your project with us at Merry Monday this week! These are so creative! 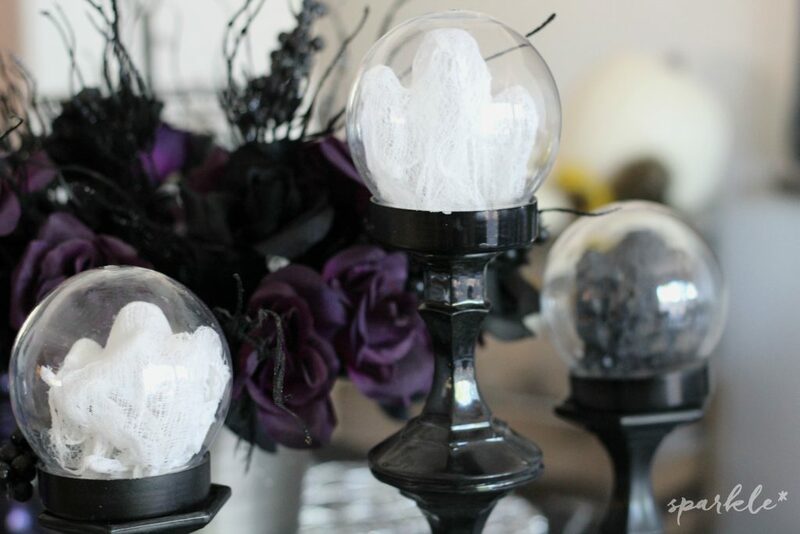 Thanks for linking up with Merry Monday – I’ll be featuring your ghostly globes at our upcoming party. We hope you’ll stop by and link up again. Can you imagine these with a battery tea light under them in the balls…even the dark one would be spookilicious! What an adorable project! Love this, thanks for sharing! What a great post. 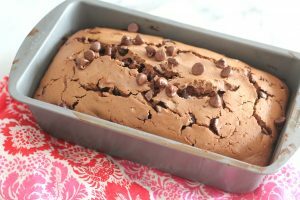 I would love it if you would share it with us at Creatively Crafty Link Party http://tryit-likeit.com/entries/link-party #CCBG. I love this, it turned out so great! 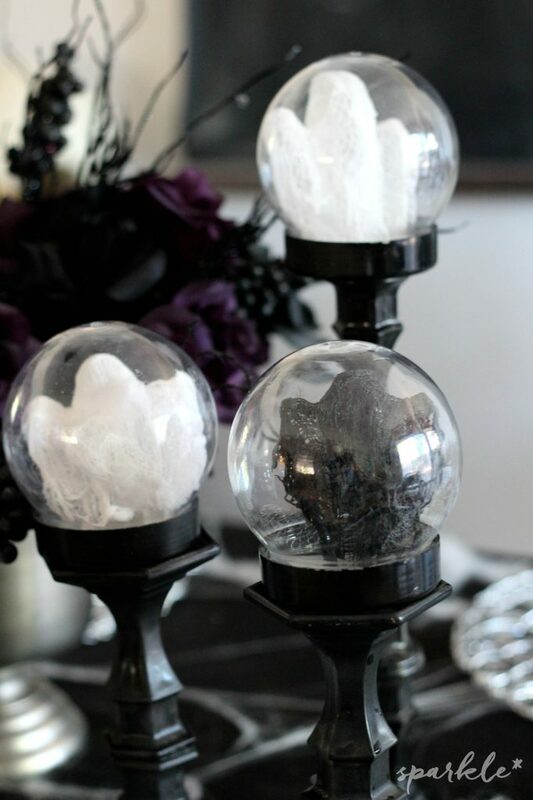 Your Ghost Globes turned out so cute. I just love them. Thank you for sharing at Thrifty Thursday Link Party. CUTE CUTE CUTE!!! I love them and am featuring them on this weeks OVER THE MOON LINK PARTY which goes live today (Sunday) at 5 pm central. Please stop by to see your feature and link up again. Very cute and I love them under the globes! Thanks for sharing with SYC.